If you’ve spent even one Thanksgiving at an average American dinner table, you’ve likely encountered sweet potatoes or yams with some kind of brown sugar or maple syrup and a marshmallow topping. I’m not knocking the tradition—in fact, I grew up eating it and usually get a craving around this time of year—but there are lots of other interesting things you can do with sweet potatoes, in my honest opinion. Now that everyone in my family knows about my culinary skills, I’ve felt the need to give my menu a few new touches to keep things interesting. Though Thanksgiving is not a Mexican holiday, I decided this year to give a few traditional dishes a Mexican twist to surprise my family. Here’s a recipe I developed to dress up the traditional sweet potatoes we usually serve on our Thanksgiving table. And, with the calorie-rich menus typically served around the holidays, this recipe is a bit healthier than traditional mashed potatoes that may be made with tons of butter and heavy cream. The marsala is a non-traditional ingredient to Mexican cooking but adds an interesting depth and sweet, nutty flavor to this dish. The chipotle should add a smoky flavor, but not be too spicy. If you’re afraid your troops will stage a revolt at the dinner table for doing something too different, you can always cut out the chipotle and add twice the adobo sauce to weaken the chile flavor so they don’t notice too much that you’ve given them the old switcheroo on the sweet potatoes. Enjoy and Happy Thanksgiving from our home to yours! 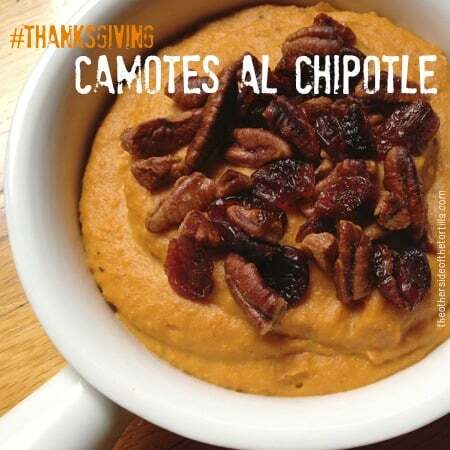 Camotes al chipotle is a whipped sweet potato dish that gets a hint of smokiness from chipotle chiles and adobo sauce. This dish is also much healthier than traditional mashed potatoes or the typical American sweet potato casserole topped with sugar and marshmallows, making it ideal for a healthy side dish at your Thanksgiving table. Preheat the oven to 375º F. On a lined baking sheet, use a pastry brush to lightly coat the cubed sweet potatoes with the canola oil. Sprinkle with the salt and pepper on top and roast the sweet potatoes for about 45-60 minutes or until browned and soft. When the sweet potatoes are done roasting, remove them from the oven and let them sit for 5-7 minutes. Melt the butter, piloncillo, marsala and evaporated milk in a saucepan over low heat. Add the adobo sauce but not the chiles yet. Stir to incorporate. Once the butter and piloncillo are completely melted, remove the saucepan from the heat and allow to cool for about 5 minutes. 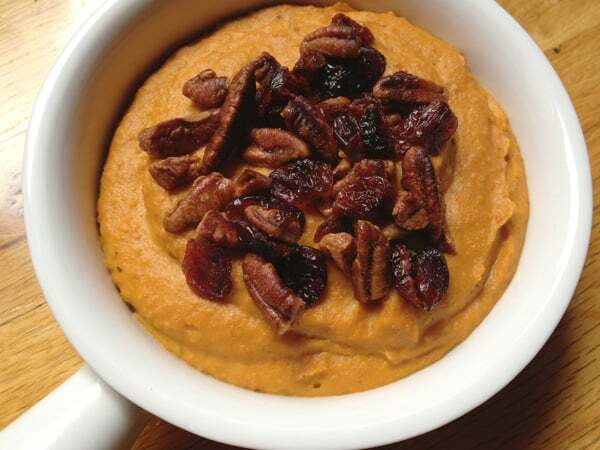 Put the roasted sweet potatoes and chipotle into a food processor or blender. Pulse a few times to get a paste going. Slowly add the liquid and run until moderately smooth. Add the extra 1 tablespoon of evaporated milk to moisten if needed. Using a spatula, remove the puree from the food processor or blender and put it into an oven-proof serving dish. Garnish the top with glazed (or plain) pecans and dried cranberries. Place under a preheated broiler for a few minutes until the pecans look like they're beginning to roast and smell nutty. Remove from the broiler and serve. Que rico!!! I love camotes and always looking for original ways to prepare them. Yum! Wow Maura!!! I’m definitely trying this on Thursday! Gracias, que rico!! Oh, I love it! I am crazy about sweet potatoes, though no one else in my immediate family is. But since we are going to a friend’s house for Thanksgiving where there ought to be lots of other sweet potato loving people, maybe I’ll give this a try? I think Thanksgiving is a great time to celebrate “melting pot” cuisine. These sweet potatoes are brillant! I like the addition of pecans for crunch. I live for anything with sweet potatoes! This a nice twist for Thanksgiving dinner. Yum!! Maura, I love sweet potatoes. A lot. I didn’t know they were called camotes and I so appreciate a new way of cooking them. Carrie, I included you in my comment to this recipe. Si, yo hago lo mismo con los camotes. My husband is german but he has come to love what I do with the whipped yams. WOW! This looks fantastic, I leave every ingredient in this recipe. This sounds deliciously rich and tangy, especially with the piloncillos, pecans, and chipotle. Monica, I’m glad you send a Facebook message to ask about piloncillo. No shame in not knowing! Plus with where you live, it might not be available. You can always order it online if you can’t find it in your local stores. I love how the smokiness and spice balance out the sweetness of the potatoes. BTW, the video was edited beautifully. Nice use of natural sounds and graphics. At 2 min plus, it’s just right. ¡Brava! I love sweet potatoes. I am definitely trying this dish! Thanks! These look amazing! I so love sweet potatoes. I must try this!